R.O.Y.A.L.T.Y. 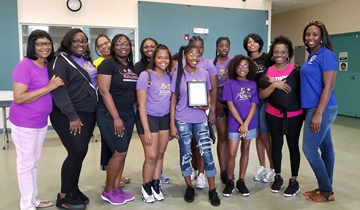 Inc. was established in 2010, with a mission to enhance the lives of young women between the ages of 8-18 years old by promoting Leadership, Education, Self-Awareness, and Service to the Community. R.O.Y.A.L.T.Y.’s purpose is to help mold young women to become loyal to themselves by recognizing who they are and who they can become. A girl that will learn who she is as she develops (Ages 8-9). A girl of high rank and high standings in her class (Ages 10-12). A young lady that holds rank in her own right. She is a noblewoman full of grace and poise (Ages 13-15). A woman eminent in rank and power. She is also a goddess and the most privileged in any realm (Ages 16-18).